I’ll be the first to defend Ant-Man (2015) from its detractors. Once I realized it was supposed to be a comedy (mostly due to Edgar Wright’s early involvement), I knew the superhero aspect would take a back seat to the laughs. That being said, I cannot defend the honor of its sequel. Sure, a lot of the elements that made Ant-Man entertaining are still present in Ant-Man and the Wasp (2018), but it’s really more of a standard superhero film that’s meant to answer questions brought up in previous films. While this film picks up well after the events of this first film and Captain America: Civil War (2016), not a lot has changed. The main characters are all there, but now Hope Van Dyne (Evangeline Lilly) also has a shrinking suit. This is no surprise, considering the after-credits scene from the first movie, so it was nice to see her get into the action rather quickly. Similarly, due to the events of Ant-Man, Hank Pym (Michael Douglas) realizes his wife is still alive and sets out to find her and rescue her from the quantum realm. Essentially, this sequel is wrapping up all the loose ends present in the first film. Part of the problem of this movie being less of a comedy (even with Michal Pena’s awesome “narration bit” again making an appearance), is that it needs to be viewed as a superhero film. Unfortunately, while the new “villain” has a neat power, she wasn’t that compelling. Even the mafia-type villains were mostly there for so-so comic relief. In the end, Ant-Man and the Wasp tried to do too much with three different storylines all competing for screen time. Sure, there was an emphasis of balancing personal life with superhero life (a la Spider-man: Homecoming (2017)), but it all felt flat in comparison to what eventually needed to happen based on the events of Avengers: Infinity War (2018). 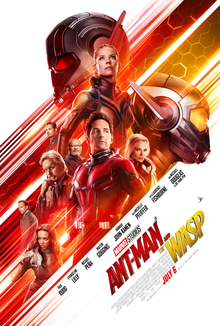 A movie that ties up loose ends and not much else, I give Ant-Man and the Wasp 2.5 stars out of 5.